Teaching With Love and Laughter: Lakeshore Review and Giveaway! This week, I received a whole bunch of awesome learning station activities from Lakeshore, which were funded by Donors Choose. Did you know that Lakeshore is now partnering with Donors Choose? You can read all about it here! This makes me very happy! And my students too! Speaking of Lakeshore, I was recently contacted by them and asked if I would like to review a product from there new line of educational toys for the home. I said YES! Of course! You can find these products at any Lakeshore store and online here. This is the Arts and Crafts Supply Center. 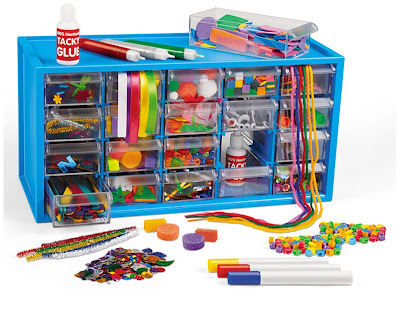 It is loaded with tons and tons of creative craft supplies, like pom-poms, wiggle eyes, ribbon, foam pieces, popsicle sticks, beads, glue, markers, and more. Everything is held in little drawers in a very attractive and durable bright blue organizer. It's perfect for home and the classroom. It really came in handy this week, because we had lots of rainy days and were stuck inside. Once I whipped out this baby, 19 frowns turned upside down! First, they tried out the glitter! Then, they made the cutest popsicle stick puppets. They tried everything! And the next day, more kids enjoyed all this art center has to offer. And, every day since then, my students have been eagerly waiting for free time, so they can create all kinds of fun stuff. I love this art organizer for many reasons. But, above all, I love that it is very easy to set up. My students take care of everything! They put on the table cloth, put the organizer on the table, and have at it. I don't have to do anything. Except, that is, watch how excited they are to explore what's in the drawers and ooh and ahh at their masterpieces. I highly recommend the Arts and Crafts Supply Center for every classroom and home. If you click on this link, you'll find a 20% off coupon, good at any Lakshore store or online. It expires on 10/31/13. And, here's more good news! The kind and generous folks at Lakeshore are allowing me to give away one Arts and Crafts Supply Center to a VERY lucky follower. Just enter as many times as you want on the rafflecopter below. Good luck! Lakeshore makes it easy to set up an awesome, creative center! Thanks for the chance to win! This would be great in my K classroom!!!! I saw this on another blog giveaway and have been dreaming of it since! :) Love it! Thanks for the chance! I love seeing how creative students will get when they are given freedom to create! What a cool product! Great products come from Lakeshore Learning!! I am so fortunate to teach Kindergarten at a school that still allows us to do " Social Centers" and my kiddos love the Art Center where they can make their own creations!!! This would be an awesome addition to that Center! The Arts and Crafts Center looks fantastic! 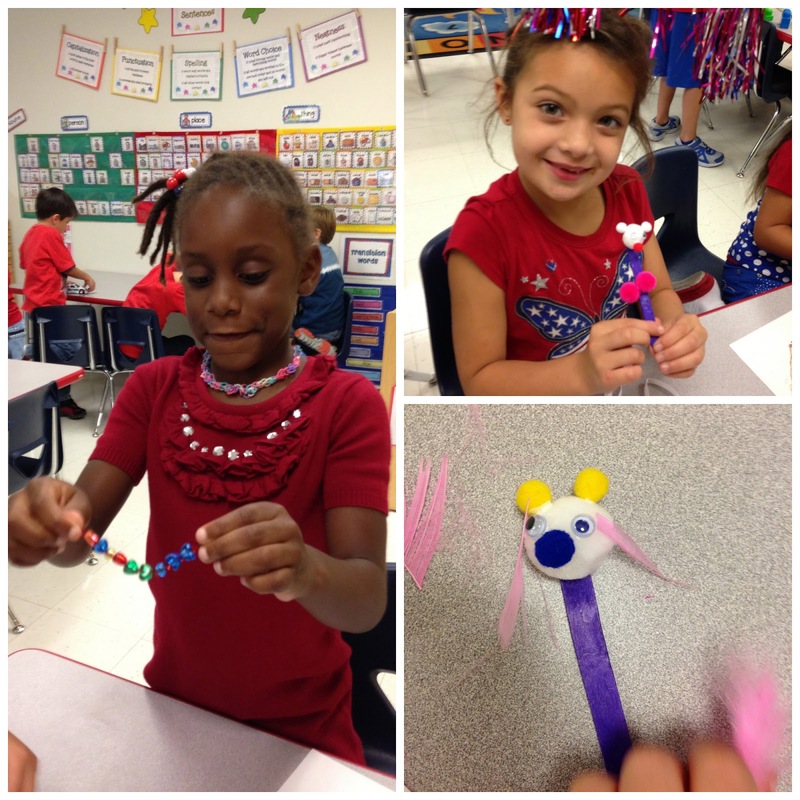 Love the pictures of your students enjoying the activities!They look like they are having fun! Lakeshore is my favorite teacher catalog to shop from! Oh, my kids would love this! Love Lakeshore products! I love to shop from lakeshore! I have had an eye on their self help book bins. 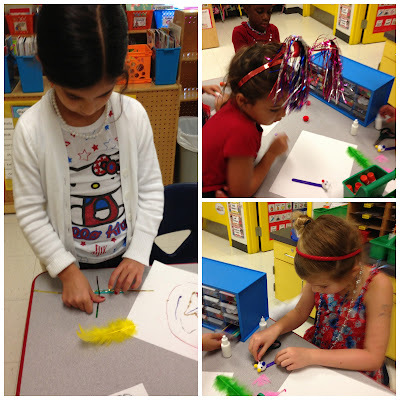 This is my first year in Kindergarten and I loved your post on Monday about your centers! It gave me so many ideas. Word woman . . . been watching for this post since I saw the teaser earlier today. Thanks for hosting!!!! Such an exciting giveaway!! Absolutely LOVE Lakeshore! I shop there several times a year. Thank you!! I love Lakeshore, but like many, I always spend too much. Thanks for the chance to win a great prize! I would like this. Please pick me... Thank you for the opportunity. I love Lakeshore! Thank goodness that there isn't one in the city I live in! I love Lakeshore as well! Such great quality products! Not certain i can really enter this from Australia but I am anyway. Lakeshore sounds wonderful. Love your blog! Thanks for the chance! Love Lakeshore! Lakeshore is wonderful! I am SO happy that your project was funded. I just added my first one, and I am always so excited to see a DonorsChoose email in my inbox. :) Thanks for a fantastic giveaway. Love your blog. I always get wonderful ideas from you. I will have to check out DonorsChoose. I used to work at Lakeshore while I was getting my teaching license...I still go there with my back to school needs each year! I love Lakeshore!! So cool to see they're partnered with Donor's Choose!! Amazing Giveaway, absolutely love Lakeshore! Thanks for posting the giveaway! It is awesome! Great products come from Lakeshore Learning!! Thanks for a chance! This looks awesome! I love giving my students creative art supplies to create things with! My dream come true would be to work for Lakeshore! I LOVE Lakeshore! I don't mind the 35 minute drive to the store because of their quality supplies and their inexpensive laminating machine. I am So glad I found your blog. I'm a homeschooling mom and I am always looking for fun ideas! You have some awesome writing ideas!!!! Looks like a perfect rainy recess idea! WOW! That looks so fun! 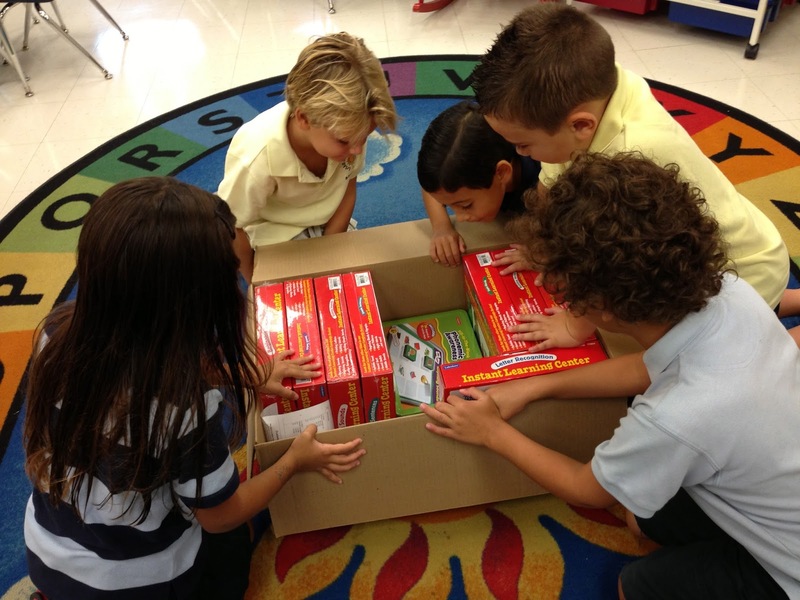 I also got a huge box last year from donorschoose and lakeshore for center time. Looks like I got some of the same ones you did too! Instant learning centers were very popular in my classroom. Lakeshore centers materials are awesome. Two years ago, I had a Donor Choose projected funded by Lakeshore for my first grade class. Wow! That is a really amazing center! It looks like your students loved every moment of using this! I love Lakeshore! I have one about 45 minutes from my house and love to go in:) Not sure dear hubby loves it that much when he sees what I spend! This would be amazing to have in my classroom. What an awesome organizer! I love all things Lakeshore too - and would LOVE to have one of these Arts and Crafts organizers. LUCKY!!! There's a Lakeshore not far from where I live. It my favorite store! Lakeshore has the coolest things! My firms ties would love this!!! I'll have to set up a new Donors Choose and order some items from Lakeshore! Love their stuff for my classroom. I love your blog, Lakeshore and Donors Choose. My class would love this art center. Isn't it amazing how creative our students become when we give them materials and time? Thanks for the info about Lakeshore partnering with Donors Choose-I didn't know! We are starting an after school enrichment program and this would be perfect for one of the art classes! Thanks for the chance to win! Joyce G.
I love Lakeshore and Donors Choose. I love Lakeshore and your blog so it's a win win! I love lakeshore!!!! I am always looking for a way to organize my art stuff in class and at ho d with my 3 little monkeys! Love Lakeshore! Thanks for the giveaway. What fun! Thanks for sharing all your ideas on your blog! Love Lakeshore!! I wish I had one close to me! Oh this would be great to win! Thanks for sharing! This would be great to win. I really need some more of these craft odds and ends and a place to store them would be even better! I love the lakeshore station boxes, such great and easy to use activities! There is nothing better then seeing those happy faces in your classroom and enjoying being there. Lakeshore is a great place to go to for anything you need for your classroom, just wish they were closer. These would make stations so much easier! Awesome giveaway and love how you used the product with your kiddos! Thank you for the giveaway. I am lucky to have a Lakeshore store close to me. They carry great products. What happy kids you have, my dear! WOW! This looks awesome! I love Lakeshore and I love arts and crafts! Thank you for the chance to win! I would love to win this for my classroom. My students seem to enjoy art activities. This might help my kiddos stay orgwnized with art supplies. Love! This would be amazing to use with my students! I love Lakeshore too! Thanks for the heads up about Donor's Choose! This product looks great:)! Your blog is so helpful!! Wow that craft organizer looks awesome! How awesome! I am so glad your kiddos got to enjoy some awesome new stuff from Lakeshore- I am currently updating my wish list! Love doing arts and crafts with my class! I would love to win this! Thank you for the chance! I love doing arts and crafts with my kiddos! Hope to win this! Lakeshore products are awesome. My students would enjoy this! Wow! What awesome supplies - looks like a ton of fun! I'd love to try to stretch my creative muscles with those supplies. Wish I had a Lakeshore in my town. I have been to the store and there are always quality items. Can't go wrong with arts and crafts. That looks like a primary teacher or a crafter's dream! What fun, thanks for the giveaway! I love Lakeshore, and thank you for the giveaway! I think students don't get quite enough art these days. Thanks for the opportunity for this awesome stuff! Your one of my favorite blogs!!! I love Lakeshore and your blog. Both give me ideas and inspiration! Love Lakeshore, enjoy your blog, and think this productis awesome! Lakeshore has so many amazing materials! I'd LOVE to have one of these supply organizers! Lakeshore is a wonderful teacher store! I love the quality and variety of teaching materials and resources. Thanks for offering this giveaway and all the wonderful ideas and materials you share. I can spend A LOT of time at Lakeshore-just ask my hubby! Thanks for the chance to win this great center. I would love to win! I love Lakeshore, and would absolutely love to add this product to my collection!!!!! How awesome to be chosen to review a Lakeshore item! The art center would be a great addition to my classroom. Thanks for the chance!! I think this is a great little center! I work at a poor private school, and anything new we need I buy so this would be a great addition, and a great break for me! I also love Lakeshore! Such quality products. Love anything from lakeshore. I got some books last year from them with my do it's choose project. You have great ideas!! Thanks for sharing! LakeShore is the Disneyland for teaachers! I always find many, many things I would like to buy. Thanks, for all of your great ideas. That is so great that Lakeshore is parting with donors choose! Our school wants us to incorporate more hands-on activities in our classrooms. Winning this would be perfect. Thanks for hosting a great giveaway! Love all that you do. Love your talents and creativity! I love Lakeshore and would love to win this! 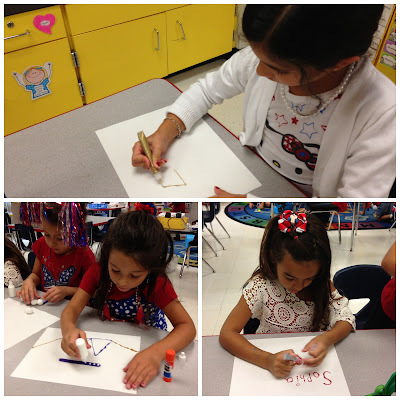 The focus for our program is to have art supplies available to students and let them create. This would be perfect for this! You know I love you, Lori!! What a great item for all parents and teachers. Lakeshore and you are the best for giving us an opportunity to win such an awesome art center. I love your ideas and site. I really hope I win this art organizer! I love giveaways!! Thank you. I need my own art materials like crazy!! I love your ideas. These will be useful in my classroom! I love Lakeshore! Thanks for sharing the love! I love your ideas!! This looks like a lot of fun. I am in the process of a new Donor's Choose project- I didn't know Lakeshore was partnering up, how exciting! 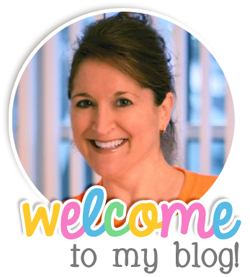 I love following your blog...I'm just getting started blogging! Come visit and leave me comments on how to make my blog better!! 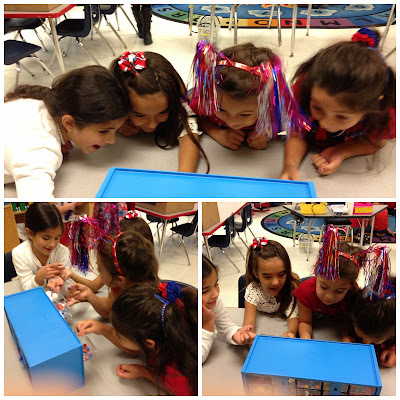 I love this pics of your kiddos checking out the new goodies! So cute! I love sharing stuff like that with my kiddos, too. :) Thanks for the chance to win! Lakeshore has so many wonderful resources. I can just go crazy (in a good way) there!